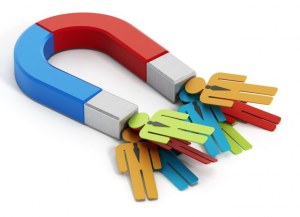 What is attraction marketing? Is it just another marketing buzzword? Actually, no. Attraction marketing is something you would be wise to consider if you’re aiming to dramatically increase the number of leads you get, day-to-day. Attraction marketing works because your customers are actually getting something for nothing. Obviously you’ll be wondering what’s in that for you… there’s plenty, as it happens. It’s just a case of ‘softly, softly, catchy monkey’ as the phrase goes. You don’t have to start giving away products and services; you just need to be seen to offer something of value, and that may be just helpful information. If your target audience is getting good information from you, they will perceive you as helpful, and hopefully an authority. Both statuses are good to aim for, because they ensure you’ll be remembered when the time comes that your audience is ready to buy. Really, this is a relationship building exercise. Because you’re focusing on the needs of your prospective customers, they will start to trust you. You will be seen as a go-to source for good information. What kind of value should you offer to your target customers? First of all, you should know your demographic well. What is it they really need? It is an ebook or guide? Perhaps it is some kind of tool, solution, or software. It might be a new recipe once a week; only you know what you can put out there for free, but whatever it is, it should showcase your kind of products and services, without any hard sell. Think about the way that some businesses set up inside supermarkets; they have their ambassadors give out free samples, but they never ask you to buy anything. When the ambassador offers you something unusual, for free, and without asking you to buy, you’re much more likely to stop and check it out. That’s simply because you don’t feel under pressure. And what are you more likely to do then? Buy it, of course. You don’t need to do any chasing or cold-calling to create leads. You’re offering value at no cost, so you have a captive audience and probably word of mouth recommendation – your leads will self-generate, eventually. You’ll be the first one people come to when they actually want your kind of products or services. Your customers will be loyal to you when they finally do become customers. How should you begin with attraction marketing? Firstly, it’s important to know your audience. Do your market research and carefully study the demographics you want to attract. Look at current and possible future trends too, so you’re one step ahead of any changes coming to your industry. Next, you should define what it is you want to put across. What is your strongest area of knowledge? What can you talk about with passion and authority? Which free offerings are easiest for you to create, but will still offer good value to the recipients? These are all worthy questions to ask yourself. Make sure your branding is of high quality; if not, this will turn your target audience off straight away. Which brings us to the next question: how are you going to reach these people? Your social media channels should all be set up, functional, with regular and relevant content. You should consider working with influencers who will share your offerings on your behalf, if they believe in you, your words, or your products. The bottom line is this: if you focus on what your customers actually want and need rather than what you can get out of it, you’ll naturally be more attractive to them. Keep this in mind and try to base everything you do on that. Once people start to notice you, you’ll go from strength to strength, and leads will start to filter in quicker than you ever thought possible. How attractive is that? For all your online marketing needs in Marbella, come to Optimasit. We are already one step ahead; after all, it’s our business. We are the best marketing and technology agency in Marbella for a reason. There’s only one way to find out what that is! Contact us now for a chat.